On April 19th of 2015 Jesus' burial Shroud, also known as the Shroud of Turin, was placed on display for the public to view until June 24th of the same year. This rare exposition of Jesus' Shroud gave time for more than 2 Million people to look upon Jesus' Shroud. Jesus' Shroud in Turin is the most scientifically studied artifact in the history of humankind. About 14 feet long and three-and-a-half feet wide, the Shroud holds the front and back image of a brutally tortured and crucified man. This artifact has been venerated by Christians for two thousand years as the burial shroud of Jesus. Yet, the Catholic Church or any other Christian religion as I know, has not taken an official position stating that the Shroud is authentic. Now I know, a claim of authenticity does not have anything to do with those of faith believing and living the way Jesus taught us. 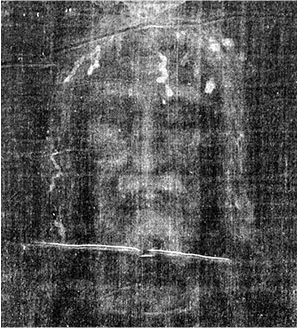 Nevertheless, since all unpretentious people and scientist knowledgeable of all the "unspun" facts about the Shroud claim authenticity, I am now calling the Shroud of Turin what it is... Jesus' burial Shroud. In addition, since all efforts in every discipline over 35 years has failed to reproduce the same exact image, I am using one word to explain how the image appeared... Resurrection. Coinciding with this public viewing, Pope Francis covered the logistics so homeless people from the city of Rome, could travel and visit Jesus' Shroud before he would visit. Then during the papal visit to Jesus' Shroud, Pope Francis met with workers, farmers, businesspeople, the sick and disabled. 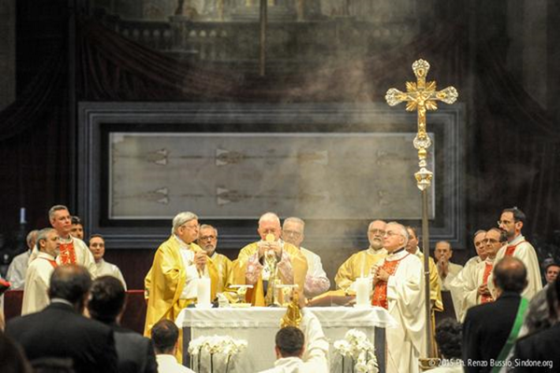 Last week the public display concluded for Jesus' Shroud with celebrating Mass. The next time Jesus' Shroud will be made available to view is unknown. Copyright 1978 Barrie Schwortz Collection, STERA, Inc.
Today, April 19, 2015, Jesus' Shroud was made available to view in a city called Turin. This public exhibition occurs five years after the last period of time people saw Jesus' Shroud. The exhibition has a 67 day schedule and over one million pilgrims already hold reservations through the Archdiocese of Turin's Online Reservation System. The final total of pilgrims will be far greater. 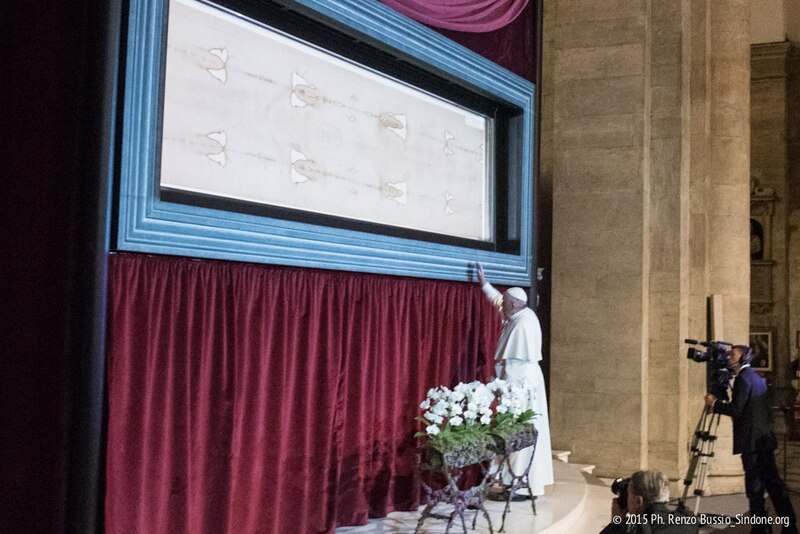 Pope Francis will visit and speak about the Shroud, before the event closes on June 24, 2015. The Cathedral of St. John the Baptist in Turin, Italy has hosted Jesus' Shroud since 1578. Now a few facts about the title of my Blog post today... I am tired of the game being played by pretentious scientists or people that just want to get 15 minutes of fame and the media dragging out a controversy just to create ratings for profit. After 35 years of real peered reviewed science, we know the Shroud is NOT a painting, NOT a scorch, NOT a photograph, and NOT a fake from a few hundred years ago. Carbon Dating tests were done on a cotton repair job performed around the mid 1300s. So the test was right, but then wrong, because the whole body of the Shroud is Linen, not cotton. Dozens of additional facts show the Shroud to be 2000 years old including a second cloth in Spain with records going back to 400AD. This cloth is known as the Sudarium of Oviedo. The "exact" same blood stains and bodily fluid marks from around the face on the Shroud match the ones on the Sudarium. The reason is because the cloth covered the same person... Jesus. All unpretentious scientists know this data. Skeptics, are now sacrificing any creditability grasping at singular points to state the Shroud is a medieval forgery, while ignoring the multitude of facts that prove otherwise. The biggest fact ignored is the one against the claim that a medieval forgery was done to fool the primitive minds of the times. The fact is that whatever was done in the 1300s we can do better and faster today with all our technology, but somehow after 35 years and thousands of tests, we can NOT duplicate the image with all its properties on the Shroud. No modern day mind with today's technology or even with old 14th century crafts can reproduce the image on the Shroud. In the end, an unpretentious mind will realize who else could this cloth cover other than Jesus. His legs were not broken, He wore a cap of thorns and He rose from the dead leaving an image on his Shroud as the last miracle to be fully understood today with our modern technology. Only because of the resurrection, a new faith was born and His followers were eventually called Christians. For two thousand years their faith grew and they didn't need to see Jesus' Shroud. We tend to separate ourselves from specific details of any tragedy. That information is always the most difficult to block out and always truly upsetting. Nevertheless, we have a part of the entertainment media that strives to shock those, who will watch, with new versions of visual suffering. The end results create a desensitized audience, thus constantly requiring new ways to present visual shock. However, they too will leave out details that everyone would relate with, in fear of those details turning the most devoted fan. The majority of us do the same with Jesus' crucifixion, we avoid the details because they prove how callous evil is in reality. Thus, to understand what Jesus did for us, is to learn the details. From the research of Dr. Pierre Barbet, Dr. Frederick Thomas Zugibe, and scientific teams that examined the Shroud of Turin, the following provides details on what Jesus endured just with the cap (crown) of thorns. First, what Thorns were used? 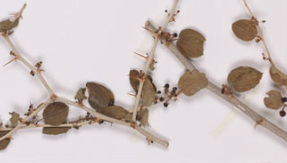 At the Hebrew University of Jerusalem, Dr. Michael Evanari, a professor of Botany presented the following information: The Syrian Christ Thorn grew in Jerusalem at the time of Jesus' crucifixion. This plant was most likely to have been used. Ziziphus spina-christi, Syrian Christ Thorn. Image by Miller, J. Yet, other experts have stated that the Christ's Thorn was used despite not being able to prove that the plant grew in Jerusalem at the time of Jesus. Nevertheless, both plants have sharp thorns that are very close to each other. Crown or Cap of Thorns? Medical experiments by Dr. Zugibe and the image on the shroud, shows the pattern of blood flow attesting to a cap and not a crown of thorns previously depicted in movies. The medical details of what this cap of thorns would do to anyone are appalling and only one person was given this cap or crown by the Romans to signify the king of Jews. His name is Jesus. Effects from a Cap of Thorns? When a Roman soldier struck Jesus with a reed, hand or any object, excruciating pain would have traveled across His face, into His ears and through His forehead. Yet, even feeling a breeze upon His face would initiate severe pain. The perception of pain in the head region comes from two major nerves. The trigeminal nerve for the front half of the head and the occipital, which is for the back half of the head. The trigeminal nerve passes through the face, including the eyes, jaw, lips, nose, cheeks, and tongue. The extremely painful condition called trigeminal neuralgia would be activated by the thorns and triggered by any slight touch, movement of the jaw, speaking or swallowing. Even temperature changes would create a stabbing pain radiating around the eyes, across the forehead, into the lips, nose, cheeks and tongue. This is agonizing pain and reported to be the worst anyone can endure. Jesus had this pain as he walked all the way to Calvary and until he died on the Cross.